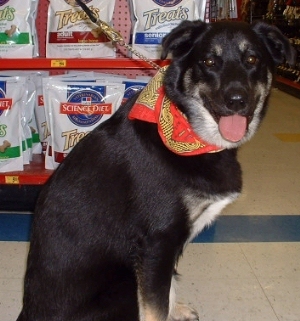 Stella is a 1 year-old German Shepherd mix female. Stella is a special girl. She has become a favorite with our volunteers because she is such a loving and attentive sweet girl. Stella is housetrained, crate trained and well behaved. She rides in a car with no problems. She enjoys playing with other dogs, but preferrs the time she has with and attention from humans. Stella will be where every her person is and will follow you from room to room. She loves toys and will be so easy to train, she already knows sit and walks on a leash. Stella has been spayed and is current on her shots and heartworm prevention. Stella has been to adoption days, and really enjoys interaciton with children, she would love to be part of a family. As you can see, Stella loves kids and being petted. Stella as a young puppy..What a cutie!